CINCINNATI - Amazon Inc. shocked the grocery world a year ago when it purchased Whole Foods, but at least one e-commerce expert thinks the Kroger Co.’s new joint venture with the British online grocer Ocado could be an even bigger game changer. “It’s a riskier bet but it has a lot more upside,” said Ken Cassar, principal analyst for Slice Intelligence, a San Mateo, California-based research from that tracks e-commerce spending with a panel of 5.5 million consumers. How big a risk? One local real estate expert said Kroger and Ocado could easily spend more than $1 billion to construct the 20 robot-powered distribution facilities they announced May 17. Slice Intelligence hosted a May 31 webinar on the rise of online purchasing options by traditional grocery chains. Cassar’s data showed Kroger has quickly established itself as an e-commerce leader with 173 percent sales growth in the 12 months ending in March 2018. Only Walmart To Go and HEB grew faster during that period. Cassar thinks Kroger’s new partnership will force industry rivals to evolve even more rapidly than they already have. “Kroger has the advantage of being the first mover but because grocery is a local business, everybody else has the advantage of being first mover to the customers that they serve in their own markets,” Cassar said. “So if I were a competitor to Kroger, I would be watching everything that they do and have budget allocated probably for 2019” to match Kroger’s capabilities. Research estimates vary widely on the size of the online grocery industry, although everyone seems to agree that sales growth is accelerating. One Click Retail estimated in January that Amazon holds an 18 percent market share with $2 billion in online food and beverage sales. That’s roughly double Walmart’s share of the $12 billion online grocery marketplace. The Food Marketing Institute and Nielsen predicted in January that online grocery sales will reach $100 billion by 2024, when it expects 70 percent of consumers to do at least some of their grocery shopping online. 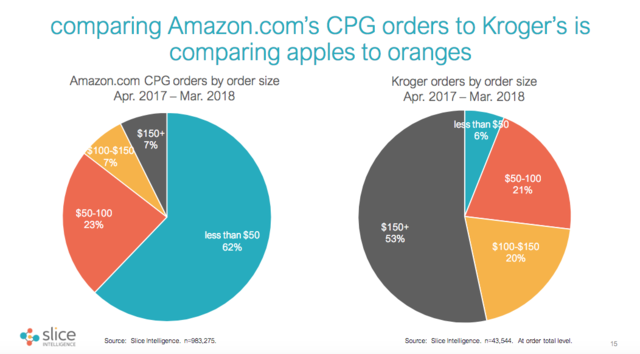 Slice Intelligence doesn’t give sales estimates but Cassar said Kroger is the nation’s third-largest online grocer, thanks to its rapid expansion of the ClickList curbside pick-up service, now available at 1,169 stores nationwide and 61 in Cincinnati and Dayton. Instacart home delivery now operates from 1,255 locations, including 89 in Cincinnati. Kroger estimates more than 40 million households now have access to those digital services and it’s trying to add more than 20 million households to that total as quickly as possible. Although e-commerce is growing rapidly in the grocery industry, Cassar said no one is doing it perfectly. Traditional grocery chains are finding it difficult to manage inventory well enough to avoid “out of stock” orders. And delivering from stores is relatively inefficient because there is a limit to how far Uber and Lyft drivers can carry orders. That’s why Cassar expects the rest of the industry to closely watch Kroger’s rollout to determine what works and what doesn’t. 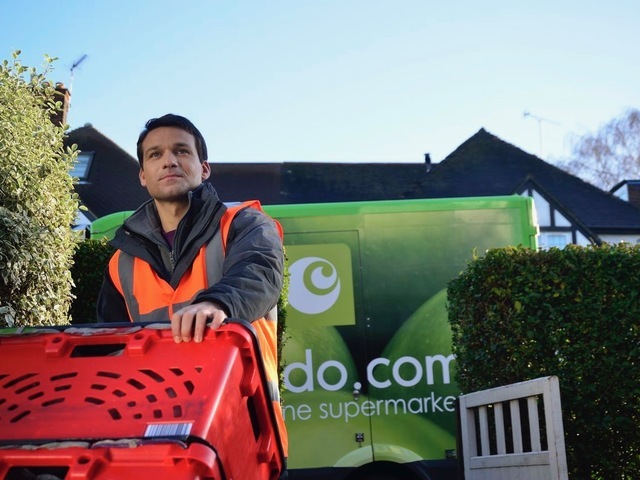 In a 2010 securities filing, Ocado told investors that it served Greater London from a 295,000-square-foot customer fulfillment center, or CFC, that had the capacity to process 130,000 orders per week and make regular deliveries to smaller "Spokes" facilities that enabled door-to-door van deliveries in outlying cities. Depending on the location, it could easily cost over $1 billion to construct 20 Ocado-sized distribution facilities in the U.S., said Doug Armbruster, a senior vice president for IDI Logistics. He's been involved in the development or leasing of more than 30 million square feet of warehouse and distribution space since 1995. "These are not inexpensive propositions," Armbruster said. Grocery distribution facilities require three different levels of refrigeration that hold food at temperatures ranging from 50 degrees to minus 30. And they need to accommodate loading docks for big trucks and interior spaces where vans can load and turn around. They also require plenty of land, which some regions lack. "The competition for space right now is fierce up and down the corridor between New York and Philly," Armbruster said. So, a building that might cost $100 per square foot in Cincinnati could fetch three times as much on the East Coast. Despite the higher costs, Armbruster and Cassar both think Kroger and Ocado will open their first warehouses in densely populated cities like Los Angeles, San Francisco and Chicago. Cassar expects the first fulfillment centers will be in different kinds of cities -- to test how much ground its trucks can cover in varying levels of traffic. Finally, he thinks the partners will mix in some markets where Kroger doesn't already compete. One possibility is New York, which often ranks first or second in weekly online sales of Simple Truth organic products even though Kroger has no stores there. Cassar thinks Kroger will use its first Ocado centers to quickly learn what kinds of product offerings work best in different cities.